And [the servant] said to [the older son], “Your brother has come, and your father has killed the fattened calf, because he has received him back safe and sound.” But he was angry and refused to go in (Luke 15:27-28b). In Luke 15, Jesus tells three parables : the parable of the lost sheep (vv. 4-7), the parable of the lost coin (vv. 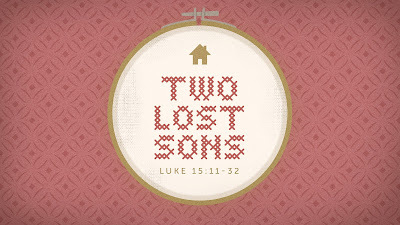 8-10), and the parable of the lost son (vv. 11-32). In the first two parables, someone searches for what’s lost. The shepherd searches until he finds the lost sheep. The woman searches until she finds the lost coin. So when we get to the third parable, we expect someone to search for the lost son. But no one does. Who should have searched for the lost son? Humanity is like the lost son. Like a rebellious child, humanity has turned its back on God and gone its own way. In the beginning, though, it was different. The first man and women enjoyed a perfect relationship with God. But when sin entered the world, humanity’s relationship with God was broken. We need for that broken relationship to be restored. We need to be reconciled to God. The prodigal son thought that he would find happiness in a place far away from his father. Instead, he ended up in a pigsty. Many people think that living for themselves will make them happy. But whether we realize it or not, what we really long for is to go back to what we had in the beginning: an enjoyment of the presence of God. Who should have searched for the lost son? The older brother. But he didn’t go searching for his brother because he didn’t care about him. Jesus is the true older brother who was willing to do whatever it took to bring us back to God. He once said, “The Son of Man came to seek and to save the lost” (Luke 19:10). He left heaven and came to earth to bring us back to God. When the older brother discovers that his father had welcomed back the younger brother and is celebrating his return with a great feast, he’s furious. The cost! He said to his father, “This son of yours doesn’t deserve this!” Unlike the older brother, Jesus disregarded the cost to bring us back to God. [Jesus], though he was in the form of God, did not count equality with God a thing to be grasped, but emptied himself, by taking the form of a servant, being born in the likeness of men. And being found in human form, he humbled himself by becoming obedient to the point of death, even death on a cross (Phil. 2:6-8). Forgiveness is free for us to receive, but it was incredibly costly to Jesus. We enjoy the feast because Jesus took the cup of wrath. Do you remember the story of the first two brothers? The older brother Cain murdered the younger brother Abel. When God asked Cain, “Where is your brother?”, he answered, “I do not know; am I my brother’s keeper?” (Gen. 4:9). The truth is, we are to be our brother’s (and sister’s) keeper. We are to show concern for the welfare of others. We are to be like Jesus, the true older brother, not like the prodigal son’s older brother.